Not strictly a sweet recipe, but you can make it sweet by spreading jam on it as I have (Ha! ), or by following my suggested alternatives at the bottom. With no yeast in this recipe, it’s really quick and easy to prepare. The original recipe used all whole wheat flour, but without the yeast I found it really too heavy; using one third white flour lightens it up a bit. If you do go for all whole wheat then add an extra half a cup of water too. 1) Put the dry ingredients in a bowl. 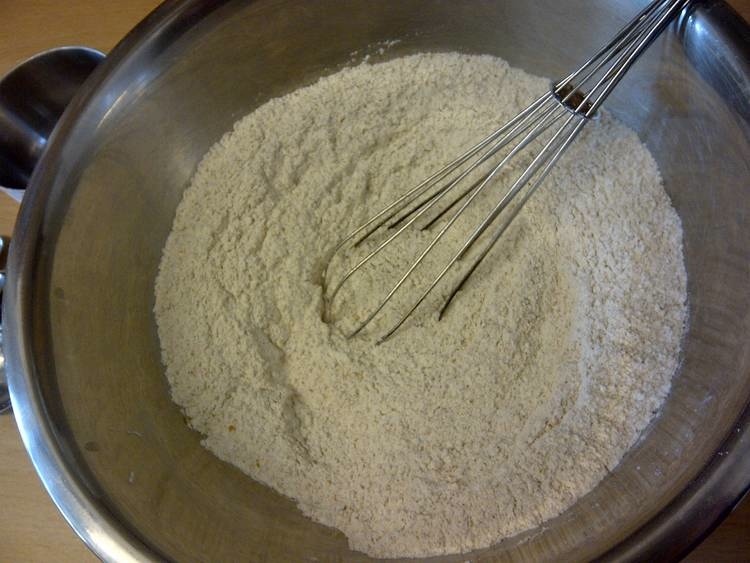 You should probably sieve the white flour, but I just give it all a good mix around with a balloon whisk. 2) Add the wet ingredients and mix it all in. I stick with the balloon whisk because the consistency stays more like a batter than a dough so you can. 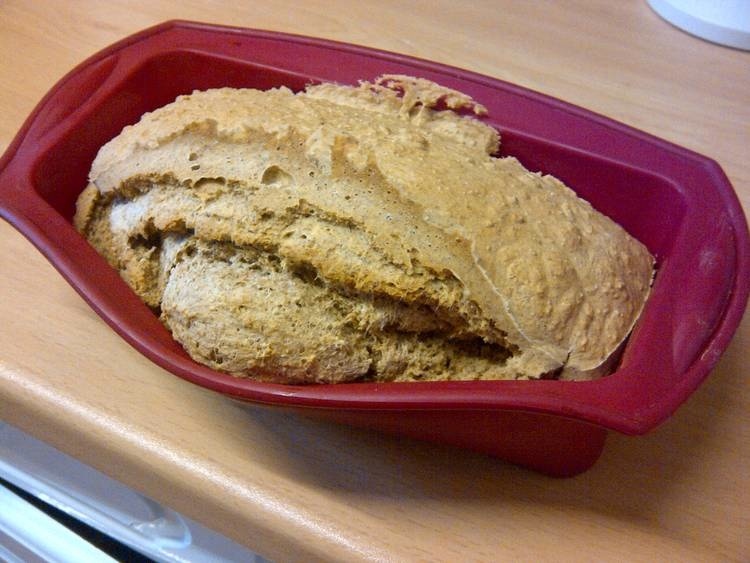 3) Scrape it into a loaf tin. I use a silicone tin which doesn’t need any lining or anything, but you may need to line if you use a metal tin, dunno! 4) Bake for one hour at 180C/350F. The top will be hard and sound hollow when you knock on it. Don’t know why it does that, if you have any ideas let me know. It kind of looks like a mouth sticking its tongue out, I was inclined to put some eyes on it, but resisted. Is it something to do with using a silicone tin rather than a rigid one? Anyway, I don’t tend to make this for guests! The consistency is great though, crusty on the outside and soft in the middle, and totally bread-like. It’s quite dense and hearty so goes well with homemade vegetable soup (you probably won’t want the jam on it though!). Banana Bread – replace some of the water with mashed very ripe bananas, add raisins and cinnamon, and something more to sweeten it if you wish. 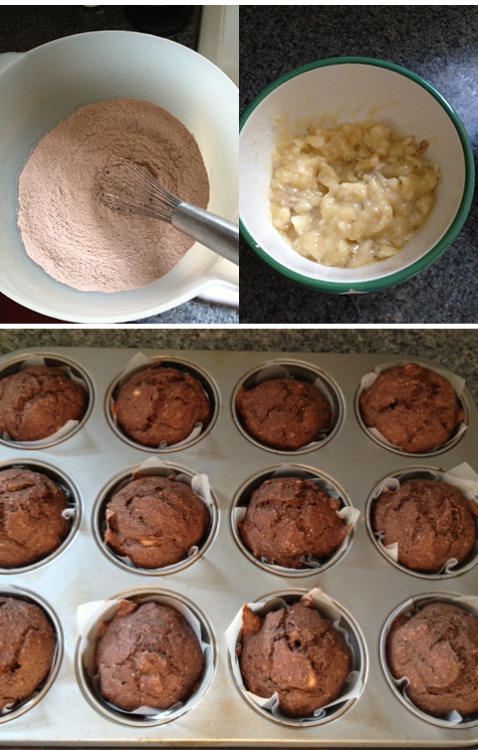 Chocolate Bread – replace some of the flour with cocoa powder, add sugar or another sweetener, plus chocolate chips. Honey Nut Bread – add honey, reduce the water, and add a load of chopped nuts. I’m afraid I don’t have specific quantities for you on the alternatives because I just judge it by eye, and by knowing what the final consistency of the batter should be like. 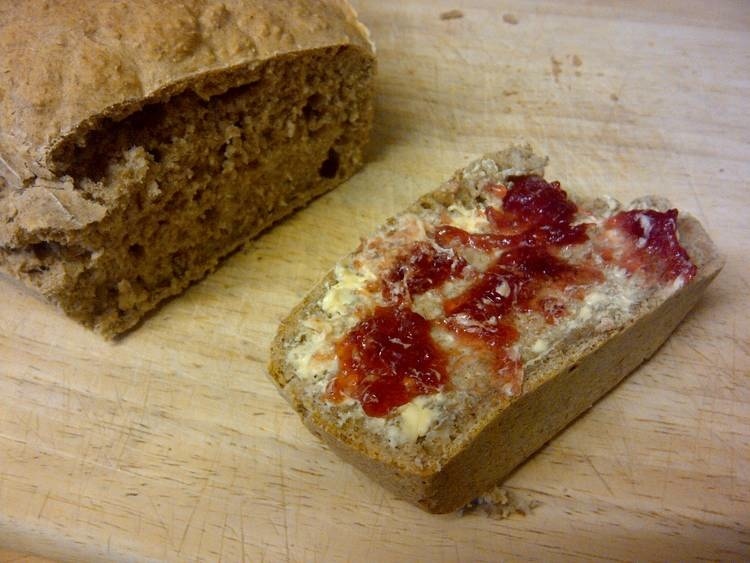 Do you make homemade bread at all, quick or otherwise? I once made bread by purchasing a loaf at the corner store, and unpacking it once back home, and enjoyed a few slices with peanut butter. In baking, as in everything, you are the expert LC. I’m supposed to be on spring break and not reading blogs, but I like baked goods so here I am. Don’t tell my husband. I like to make banana bread. I also have a version of banana bread with peanut butter in it and chocolate chips on top. Really yummy. This recipe looks great. Nice and simple. And apparently explosive. Ooh, peanut butter in banana bread sounds good! The banana bread recipe that Gabriela gave me, which I put on the post about agave nectar is much nicer than this version, but there’s a bit more work involved, so for a quick one, this does the job. I’m quite slow when it comes to cooking and baking, that’s why I love this recipe – while I’m making dinner I can quickly mix up a batch and then pop it in the oven when I take out whatever I’ve made for dinner! Thank you! I shall have a look at your site later too! You really should, I know you like simple recipes and this one really is! I used to make bread more often, when I had an oven with a proofing setting. It was so handy! But now it’s a rare treat when I do it. I can’t remember the last time I made proper bread with yeast, but this one is so easy I knock it out fairly regularly. Yum! I am something of a bread addict, but I can never seem to get that yeast ratio quite right. This looks like the perfect simple experiment for me to try! Yes do! If yours doesn’t erupt then I’ll want to know what you did differently! I ended up trying some of your substitutions: 1/2 cup of cocoa powder instead of whole wheat flour, and 2 ripe mashed bananas for 1/2 cup of water. Everything else I kept the same. I poured the batter into muffin tins and baked at 180C/350F for 20 minutes. They came out so delicious! I’m not sure if you can see the photo I took of them, but if you can, you’ll see they look like cupcakes. 🙂 They taste distinctly like wheat muffins, though, with just a hint of chocolate sweetness, and the bananas adding a very nice moistness. This was so easy, I’ll have to make them again! Ohh enjoyed this post! In answer to your puzzle, what did you proof your bread in? I don’t proof it because it has no yeast in it. Ah yes, d’oh. The lack of yeast could be why the bread has gone this way maybe? Because you haven’t used the yeast, the bread will be denser? Who knows.. misshaped puzzle. Not only does yeast affect the finished bread, but so does kneading. A coarser texture is produced if the bread is not kneaded. 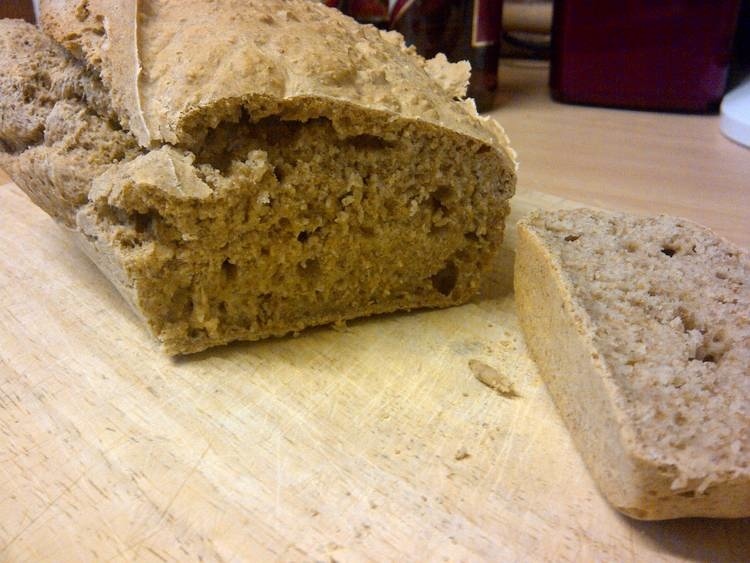 Therefore stirred yeast breads will be “more rustic” than kneaded breads; that’s the trade-off! Yes but I just don’t think that normal bread rules apply here, it’s more like an egg-free, sugar-free cake recipe than anything. When I make banana bread, or other kinds of loaves like this, it never erupts. The denseness I understand, but not the eruption! It’s really best to buy a set of proper measuring cups for baking because it is a standard size. You can pretty much get them anywhere that sells measuring spoons and bakeware. I got used to using cups rather than weight for cooking when I lived in America and it really is so much quicker to measure out your ingredients! 1 cup is pretty much a coffee cup size.